Dubai, UAE – 10th July 2018: The MB&F M.A.D. Gallery is proud to present ‘Time Machine 3’ (TM3), an installation of impressive rhythm and kinetic art, designed and developed by Florian Schlumpf, an expert engineer with a passion for art and mechanical precision. Schlumpf uses his art to explore his interest in clocks and precision mechanisms, and perfect function is of the utmost importance to him. 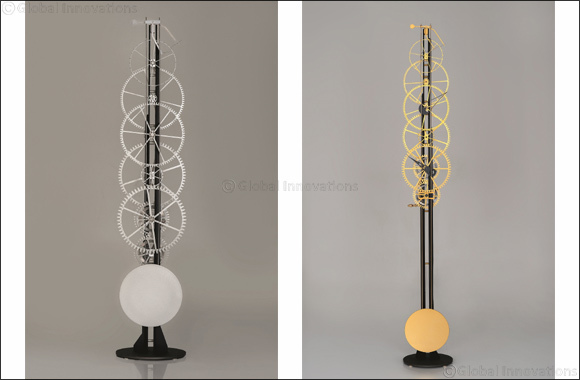 The Time Machine (TM) collection consists of three compositions celebrating the mechanical precision and sensory pleasure of a traditional clock in a purely artistic manner. Each variation, of the TM collection exposes the inner workings of the clock mechanism and places the motion of each gear, spring, and axle in the spotlight. The TM3, runs for eight days driven by double spiral springs and axles supported by ball bearings with non-contact seals to reduce friction. This piece also incorporates patent-pending anchor arms built with spring-loaded technology providing smooth, almost silent operation requiring minimal energy. The TM3 weighs only 10 kg while measuring 1.3 meters (4.25 feet / model “Kaspar”) or 1.8 meters (6 feet / model “Johann”). It can also be mounted on a wall or display as a standing art piece. Previous Story : Back to School Is Near and Al-Futtaim Ace Has Got Your Gear!